This text is the BBC's English Transcript of the Thai Documentary Film on Acariya Maha Bua and Baan Taad Forest Monastery. Download here the pdf of the text. Venerable Acariya Maha Bua Nanasampanno was born into the Lohitdee family on August 12th, 1914 in Baan Taad village which is located in Udon Thani province in the northeastern part of Thailand. He is one of 17 children from a family of rice farmers. As a child he entered school and received an education right up to the third grade level - the highest level available in his village at the time. From the time of his childhood he was always sincere, truthful, resolute, and reasonable - characteristics which were to be of great help to him later in the practice of Dhamma. At the age of 21, his parents asked him to enter the monkhood in keeping with Thai tradition. Doing so shows one's gratitude towards one's parents. Eventually, he decided to ordain at Yothanimit monastery in Udon Thani province. 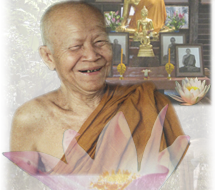 He was ordained on May 12th, 1934 with Venerable Chao Khun Dhammachedi as his Preceptor. His Preceptor gave him the Pali name 'Nanasampanno' which means 'one endowed with wisdom'. He intended to ordain simply out of tradition and had no idea of remaining a monk as long as he has. After entering the monkhood, he studied the biographies of the Lord Buddha and his Enlightened Disciples, and became so impressed with their lives that there arose within him feelings of faith, confidence and the desire to gain the same attainments as the Enlightened Disciples of the Lord Buddha. He decided to study first in order to understand the way of practicing the Dhamma which would in turn lead to Nibbana (Nirvana). However, he set himself the condition that he would not study past the third level of Pali studies for fear he would forget himself and the true goal. This was the path by which he set to discipline himself. During his Pali studies he sometimes passed and sometimes failed. So, too, he spent time studying Dhamma and Vinaya - Vinaya being the monastic rules of correct conduct. After a period of seven years he finally succeeded in passing the third level of Pali studies together with the highest level in Dhamma and Vinaya studies. After that, he aimed solely at the practice of Dhamma with hopes of studying directly with Venerable Acariya Mun, one of the most renowned meditation masters at that time. He had heard of Acariya Mun while still a youth, and now, since the time of his ordination, Venerable Acariya Mun's reputation had grown even greater. While Venerable Acariya Maha Bua was in Chiang Mai, he had the chance to talk with those senior monks who had stayed with Acariya Mun. He heard of the practice and routines followed by Acariya Mun, and from what was said it was clear that Acariya Mun was not an ordinary monk but one of those Fully Enlightened. Acariya Maha Bua's heart thus became more intent towards his own personal practice. He determined to devote both his heart and life totally to Acariya Mun with the confidence that the Paths, Fruitions and Nibbana still existed. He then went in search of Venerable Acariya Mun, and when he finally met him he was pleased with his efforts because it seemed as if Venerable Acariya Mun already knew his desires, intentions, and doubts. All questions in his mind were clarified and set straight by Acariya Mun, who made clear to him that the Paths and Fruitions leading to Nibbana still existed. All doubts vanished, and he said to himself: "Now, I have come to the real thing. He has made everything clear and I no longer have doubts. It is now up to me to be true or not. I'm determined to be true!" That was in 1942. From that time on, he entrusted himself to Venerable Acariya Mun. As a disciple of his, he studied and practiced with strong and earnest determination. He began to take his meditation practice very seriously. Living in the forests and mountains in peaceful seclusion and away from villages and people, He was determined that whether he lived or died, his heart would be directed solely towards the Paths and Fruitions leading to Nibbana. 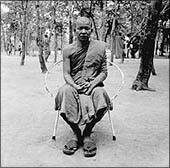 While studying with Venerable Acariya Mun, he learned the methods of practice, including meditation, followed by Acariya Mun based on the principles of Buddhism and the code of Buddhist discipline. And he himself practiced until he had a firm and clear vision of his own heart without the least shred of doubt. Consequently, he has continued to follow these same methods of practice in both his own teaching and training of monks and novices. Owing to the deep respect and admiration he has for Venerable Acariya Mun - whom he has likened to a father and mother to his students - he was inspired to compose a biography of Venerable Acariya Mun which aimed at disseminating his methods of practice as well as documenting his exemplary character for the sake of coming generations. Furthermore, as testament to his reverence to Venerable Acariya Mun, he has written many books on the practice of Buddhist meditation, together with many recorded teachings on Dhamma in order that Buddhists will have a path to follow in the practice of meditation. The first Rains Retreat he spent with Acariya Mun was at Khok village in Sakon Nakhon province. The Rains Retreat is a period of intensified practice lasting for a period of time from July into October. He stayed with him at this location for two years. He then followed Venerable Acariya Mun to spend the following Rains Retreat at the village of Nong Phue Nanai located in the district of Phannanikhom in Sakon Nakon province where he spent the next six years. Altogether he stayed with Venerable Acariya Mun for eight years up until the Venerable Acariyaís death in 1949. After the cremation of Venerable Acariya Mun, Venerable Acariya Maha Bua prepared himself to escape to the forests and mountains in order to find a secluded, peaceful place to develop his meditation. But a group of monks and novices all asked to accompany him in the hope of having him teach and guide them. He tried to avoid them in order to increase his own personal efforts for the attainment of his one ultimate, long time goal. Finally, when he had attained his goal, he reflected with sympathy on others who were looking for a suitable Teacher who would be able to show them the way just as he had himself sought in the past. He therefore took the methods of practice and the marvelous truths that he himself had experienced in heart and taught them to his followers: monks, novices and lay people in general. At first, he returned to stay at Wat Nong Phue Nanai where he had lived with Venerable Acariya Mun. This was because, after Venerable Acariya Mun had passed away, the large number of monks and novices who had been staying there had all left, leaving only one old monk to look after the monastery. Feelings of pity and sympathy arose in him and he decided to return to this monastery for one more Rains Retreat. In 1950 Acariya Maha Bua looked for a quiet, secluded place, and so he went to stay at Huey Sai village, in what is now Mukdahan province. During his stay here he was very strict and serious in teaching the monks and novices, both in the subject of the austere dhutanga practices as well as in meditation. He pursued this method of teaching until these same principles of practice became increasingly established within his followers. He then learned that his mother was ill and so returned to his village near Udon Thani so that he might look after her. Back at home, villagers and relatives requested that he settle in the forested area south of the village. They also asked him to make his residence permanent, as a favor to them, and to no longer wander in the manner of a forest monk. Through the donation of a piece of land of approximately 64 acres, he would be able to establish a monastery. Considering that his mother was very old and that it was appropriate for him to look after her, he accepted the offer and began to build this monastery in November of 1955. It was named Wat Pa Baan Taad. These 5 parts of the body taught during the ordination ceremony are subjects of meditation. The newly ordained monk or novice is supposed to contemplate them in order to become aware of the body‘s true nature - as being something not inherently beautiful, but, instead, impermanent, subject to change and disintegration, and not one‘s self. These five parts, which form the external surface of the body, ordinarily excite lust and attachment. But when they are properly analyzed and contemplated, the mind can develop detachment to the objects of lust - and to lust itself - and is freed to devote itself to meditation in quest of more lasting and worthwhile forms of happiness. This is the purpose for which Acariya Maha Bua built this monastery. Along the Khon Kaen - Udon Thani highway, at kilometer-post 555, 7 kilometers from the town of Udon Thani, is an intersection in front of Kum Gling village. Here is a sign and an arrow pointing out the tarmac road to Baan Taad Village. Eight kilometers further down the road from Baan Taad village is a piece of land cool, shady and quiet. It is covered with forest well looked after, and protected by a concrete wall that encircles the area. Since this monastery was established 30 years ago, the general condition of the forest remains as it originally was, lush in vegetation of many types and home to many types of forest animals. The overall view is that of forest hilltop surrounded by rice fields. This is probably the only unspoiled piece of forest left in Mueng district, Udon Thani province. The wilderness surrounding the monastery has disappeared since the area has been cleared for cultivation. The forest that remains inside the domain of the monastery is only a remnant of what the forest once was. Wat Pa Baan Taad has tried to conserve its remnant of the forest in its original, natural condition, so that monks, novices, and lay people can make use of its tranquility for the practice of the Dhamma taught by the Lord Buddha. From a desire to make this teaching a reality, and not just a ceremony, comes a model for a lifestyle devoted towards serious practice. As a consequence, life goes on here with the utmost simplicity - making do with what little one has - and with great contentment. In the beginning, the boundary of the monastery was not fenced. But in order to protect the many forest creatures who sought refuge in the shade and tranquility of the monastery, and in order to prevent outsiders from entering the area and disturbing the meditation practice of the monks and novices, a concrete wall was built to enclose the area. This wall is thus like a strong fortress enclosure that offers quietude and protection to the forest creatures, as well as the necessary serenity needed by the monks, novices, and lay people who are endeavoring to free themselves from mental defilements and attain the full release of Nibbana (Nirvana). Passing through the gate into the compound, we find along both sides of the road rows of trees which hide the forest behind them. The atmosphere is pleasantly shady, tranquil, clean, and orderly, reflective of the calm minds of its inhabitants. Throughout the whole compound, the monastery is free from bothersome noises. The only sounds are the occasional calls of the forest creatures and the other sounds of nature itself. Taking an overall view of the monastery, the first thing we notice is the large sala, or meeting hall. It is built of hard wood, and is rectangular in shape - its dimensions roughly being 27 meters by 20 meters. It is raised up off the ground to a height of about eye-level. The floor - also of hard wood and highly polished - is raised in three steps. At the very back of the sala is a room for housing the Lord Buddha image, as well as a storage room. These are divided by a wooden wall and surrounded by a movable metal gate that can be opened and closed. There are three flights of steps leading up to the sala: The largest at the front of the sala with two smaller stairways in the back at the left and right sides. Along both sides of the sala are large cement tanks for storing rain water. There are three tanks on each side. The area immediately surrounding the sala is compressed gravel for walking and for parking cars, with the forest surrounding the perimeter of the whole sala area. From above we can get a bird‘s eye view of the triangular clearing surrounded on all sides by forest. The three sides of the triangle being symbolic of the Buddha, Dhamma and Sangha. Originally, the sala was quite small, and was built with a thatched grass roof in 1955. Four years later, in 1959, it was built with more permanent wood. In 1961, additions were added to both sides of the sala to accommodate the increasing number of supporters, and with this the sala took its present form. Later on, the foundation posts were changed from wood to concrete owing to the damage termites had done to the original wooden posts. This also prevents any future deterioration from occurring. Under the sala is a spacious, open area for resting or storing things. Every part of the sala is simple in form. There is nothing extravagant, for everything has its necessary purpose. It is a multi-purpose building and the central gathering place for those many monks, novices, and devotees, who have come to Wat Pa Baan Taad for religious ceremonies and as a place for receiving instruction. The sala is used as an eating hall, and as a place to both receive and temporarily lodge the monks, novices, and groups of lay people who come to stay for a short time on various occasions. Stepping into the sala from the front stairway, we see a large open area. Throughout the whole sala, the floor is clean and polished to a bright shine. Looking into the sala, every pair of eyes will be pulled to one prominent point - the large Buddha image in the gesture of banishing Mara, the Evil One. 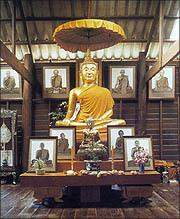 This is the principle Buddha image in the sala and is located at the far end. Behind it are pictures of Senior Teachers and Respected Elder monks who are held in high respect by monks, novices, and lay people in general. 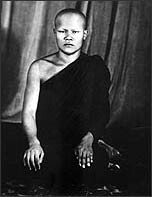 There are pictures of Venerable Acariya Sao Kantasilo, Venerable Acariya Mun Bhuridatto, Somdet Pra Sangharaja Krom Luang Vajirananavong, and Chao Khun Dhammachedi Chuum Bandhulo. In the display case stand urns containing the relics of Venerable Acariya Sao Kantasilo, Venerable Acariya Mun, and Venerable Acariya Sing Khatayakhamo of Wat Pa Salawan. There also are pictures of the Elder Meditation Masters who followed them in the forest meditation tradition. These include: Venerable Acariya Waen Suchinno, Venerable Acariya Khao Analayo, Venerable Acariya Lee Dhammadharo of Wat Asokaram, and Venerable Acariya Fun Ajaro. To these images, pictures and relics, the monks and novices pay their respects every morning and evening. From the sala are many paths running off towards the areas assigned as dwelling places for the monks and novices. The dwelling structures themselves - called kutis - are single units scattered throughout the dense forest. They stand fairly for apart and are separated from each other by strips of forest dense enough so that the inhabitants canít see one another. The whole area is tranquil and quiet, more so than the front area of the monastery which we have just mentioned. A monk will stay alone at his kuti without interactions with others. He spends all his time concentrating on his own practice - exerting himself in the practice of sitting and walking meditation in the area of his own kuti as if he were the only person around. He doesnt stop to chat with others, but follows in full detail the methods and forest practices taught by the Lord Buddha. The kutis themselves are of two general types: permanent and temporary. Kutis of the more permanent type are few in number. They are not overly large as they contain one medium-sized room measuring about 2 1/2 meters by 3 meters, together with a door, windows, a small porch - and they stand raised about one meter off the ground. Strongly built, they are simple in design with nothing too beautiful or elaborate to attract attention. The ground around the kuti is level and smooth and contains paths for walking meditation in both the front and back. The whole area is well kept, clean and tidy. It is then enclosed by a strip of forest in order to hide it from the eyes of passersby. Its almost as if one couldnt tell that there was a dwelling there at all. This is so that the monks can devote themselves to their practice uninterruptedly, without fear of other people entering the area and disturbing them. Most of the kutis where the monks stay are, however, of the temporary type. These small huts or shelters are easy to erect and just big enough for lying down. They consist of four posts, are roofed with either grass or corrugated tin, and have a living platform raised about a half meter off the ground in order to protect against snakes. Since there are no proper walls, monks use old robes to protect themselves from the sun and rain. These robes are easily made to be drawn open or closed on all sides. This type of kuti is comfortable in the hot season since wind is able to enter from any direction; they are somewhat less comfortable in the cold season, and especially during the rainy season. With such a simple style of life there is contentment in living with little. Inside the kuti, one finds only a klot - a large forest umbrella that can be fitted with a mosquito net - a grass mat, a blanket, inner and outer robes, and a few other small necessities. This is because monks hold that warmth, coolness and comfortable conveniences are but external pleasures which are neither permanent nor dependable. Lasting happiness is to be found in the heart. If one has severed the mental defilements of greed, hate, and delusion, the heart is happy. When comforts and conveniences lend to these defilements, these defilements in turn lead to suffering and dissatisfaction. So here there are no conveniences. The monks live in keeping with necessity in order to truly know and practice the Dhamma as taught by the Lord Buddha. The area in which the monks and novices dwell is a reserved section of the monastery. Visitors and relatives are not normally permitted to enter and stroll around. This is so that the meditation practices of the monks and novices will not be disturbed. As a compromise, visitors are allowed to enter the area while the monks and novices are in the sala taking their morning meal, as long as the visit is done quietly and without a lot of noise, since everyday there will be some monks and novices who are fasting, and so increasing their efforts in meditation within the bounds of their own kuti. Besides the dwelling area of the monks and novices, there is another area located to the right of the main gate. It is a section divided into a kitchen where lay people can prepare food, and a temporary dwelling place for lay followers who have come intent on practicing meditation. A temporary stay means a short stay, and must be approved by Acariya Maha Bua who takes into consideration what is necessary and suitable in each individual case. Because space is limited, permission can not be given for stays that are unsuitably long. Here are found only a few dwellings together with paths for walking meditation identical to those used by the monks and novices. Beside the dwellings in this section is a large concrete pond in which many kinds of water lilies grow. The shelters on the edge of the pond give the practitioners there a pleasant place for meditation, or for just resting. The pond also serves as a water reservoir for times of drought and has the benefit of being both a habitat and drinking area for many different types of creatures. Concerning drinking water and water for use at Wat Pa Baan Taad, cement piping, one meter in diameter, has been sunk about ten meters into the ground to make a well. Water from the well is pumped by hand and distributed throughout the monastery in two-wheeled push-carts to the large water jars at the kutis, bathing areas, rest rooms, and other points. This water is then used for bathing and washing. For drinking water, rain water is used, and this is stored in the large cement tanks found the sala and in the area of the lay followersí kitchen. At the kutis are square, galvanized steel tanks, or cement tanks, for storing the rain water which is used for drinking. These tanks hold enough to be used throughout the year. As we have seen so far, the overall condition of the monastery is neat and orderly. In all the areas we look, we find quietude and a brightness reflective of the minds of those staying here. This quietude arises naturally, without disturbance from defilement or craving. The only sounds are those of the forest animals who live in peace in the shelter the monastery provides. We can say that this place is a genuine domain of Dhamma in that it adheres to the ideal form of a forest monastery - free from modern buildings and conveniences, and with no electricity or running water. Here exists simple solitude and those things which arise of themselves naturally; things which might, perhaps, bring fear to people in general, but which here serve to mold those living here to be strong, persevering, patient, earnest, and diligent. These attitudes and virtues help in fighting the obstacles and barriers put up by such defilements as attachment and craving, in order that mindfulness (sati), concentration (samadhi), and wisdom (panna) might arise. Mindfulness, concentration, and wisdom are the tools which obstruct the Cycle of Death and Rebirth, making it shorter and shorter until final liberation can be reached. Although many faithful followers and supporters want to make merit by providing the monks and novices with various comforts and conveniences - such as the installation of electricity, telephones, water pumps, and even to the extent of building an Uposatha meeting hall and kutis for making the task of meditation more comfortable - Venerable Acariya Maha Bua has refused. The reason he gives is that these things are not necessary. In worldly life they are considered to promote pleasure and happiness, but from the point of view of the Lord Buddhaís teachings they are enemies to the practice of Dhamma. In the Lord Buddhaís time they didnít exist, yet the lives of the monks were happy and many reached full Awakening. 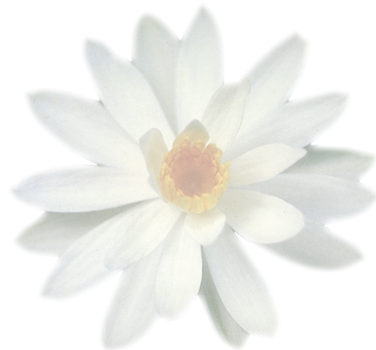 They never took these things as a substitute for the Paths, Fruitions, and Nibbana. For instead of giving comfort to the monks and novices, these worldly things cause laziness, discouragement, and weakness. Conjoined with this type of ease is craving, which, in turn, is the greatest obstacle towards the development of meditation. The forest monastery, as a place conducive to reflection, provides a fitting environment for the search for true and pure happiness, in accordance with the Buddhist way. What I have taught you so far should be enough to give you some idea of this path. For example, the ascetic practices: Eating one meal a day is one of the 13 ascetic practices. Almsround is another of the 13, one which cant be broken as long as you are eating. Eating from the alms bowl is another one, one which is clearly practiced here. Theres nothing secretive or mysterious about these practices, because theyre clearly there in the texts. And Venerable Acariya Mun absolutely followed the texts. In terms of the practice of using robes made from cast-off cloth, I havent seen anyone at present who is his equal. He took up this practice right after his ordination and continued right up to the end. He can be considered perfect in this practice, for he never wore pre-made robes given by others. See how outstanding he was? Where can anyone like that be found today? Where can you find anyone who, like Venerable Acariya Mun, can perfectly uphold this austere practice from the time of ordination until death? This was one of the ascetic practices he was very resolute about, and he practiced it consistently without breaking it in any of its particulars. As for meditation. . . Here were talking only a little about a couple of the ascetic practices, such as living in the forest or living in a cemetery: These are all included among the ascetic practices. In everyone of these practices, theres no room for doubt. To live in caves, under overhanging cliffs, etc... all of these things are found in the instructions to a newly-ordained monk and in the 13 ascetic practices. These are the teachings, methods and practices that were followed by Acariya Mun and which we can implicitly trust. All of us have taken to this path at present because he led the way. Here were talking about only some of the 13 ascetic practices, not all of them. For example, nesajjika, in which we undertake not to lie down for a certain number of days and nights: This is also one of the ascetic practices.